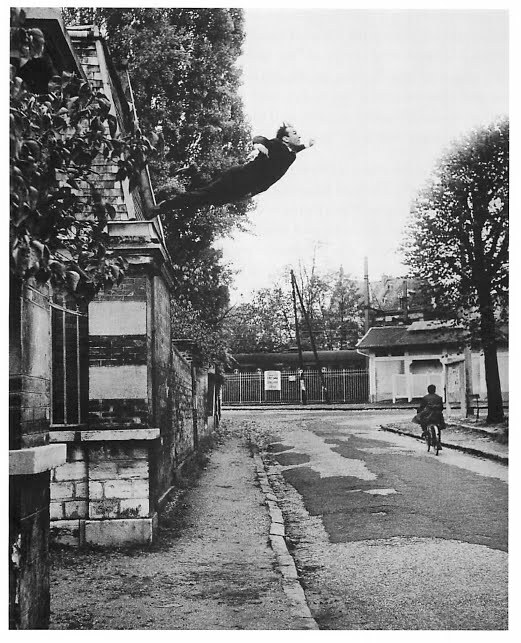 That’s the artist Yves Klein jumping off a building in the photograph above. Taken on October 19, 1960, the photograph is titled The Leap into the Void. 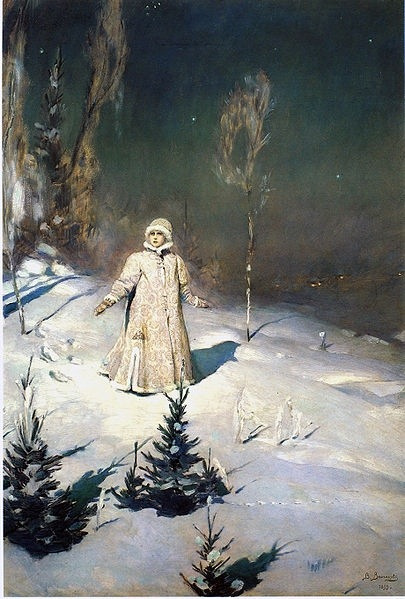 The first time Klein leapt, he broke an ankle. It’s my understanding that he considered that first jump—taken months before the October leap—the one that really counted. He jumped again to document the performance, and the second time there were people below holding a tarpaulin in which to catch him. He later created (or his photographers created) a photo montage that made him appear to fly. I once tried to learn how to fake-levitate. I studied the Balducci method, which involves balancing on the toes of one foot, while the other foot, the one closest to your small, carefully positioned audience, is raised two or so inches off the floor. What the audience sees is a person who is no longer standing on the ground, and you must come down quickly so that they don’t have a chance to look too closely. I had understood that levitation was an illusion, but I was still disappointed, because I was the audience I wanted to convince. I couldn’t quite master the technique, anyway—I don’t have solid control over my toes. Solnit adds, “[H]e seems never to have stopped being a child in some ways, spoiled, petulant, impatient with restrictions, but also festive, generous, playful, and imaginative.” I think it’s nice of her to include some of the positive characteristics of being a brat. My favorite books feature characters who spend a lot of time alone (or nearly so) with the sea and sky: The Old Man and the Sea, The Life of Pi, Diary of a Shipwrecked Sailor by Gabriel Garcia Marquez, and Ahab’s Wife. Again, it’s about floating. Ernesto and I spent a lot of time floating in the Gulf of Mexico during our August vacation, even after his mother sent us a message warning of the possible presence of a deadly bacteria in the Gulf. The water was equal parts blue and gray, sometimes rough. We tried very hard to recreate the sound of the waves, but we always ended up sounding like windstorms or shushing librarians or static. We were working on our surf-noises when the most amazing thing happened. At the same time, we both spotted a reddish, gold-tipped cylinder bobbing in the waves, heading toward us. “What’s that?” Ernesto asked, and I knew at once what it was, because I had been waiting for it my whole life. “It’s a cork in a bottle!” I said, and I raised my arms and danced toward it through the water as fast as I could, hoping that the message inside the bottle would still be legible. It was not a cork in a bottle. It wasn’t even a cork without a bottle. It was an empty shotgun shell. I will never be compared to a streak of light across the sky; I have always been more moon than star. 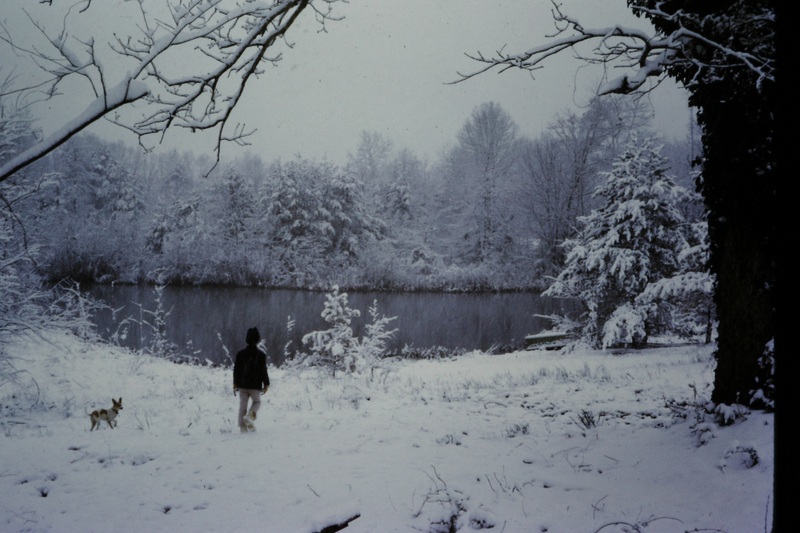 The proof is in my own Leap into the Void­-style photograph from the very same month and year as Klein’s: October 1960. Face, belly, matching knees: it’s as if milk-white moons aligned to create a child. 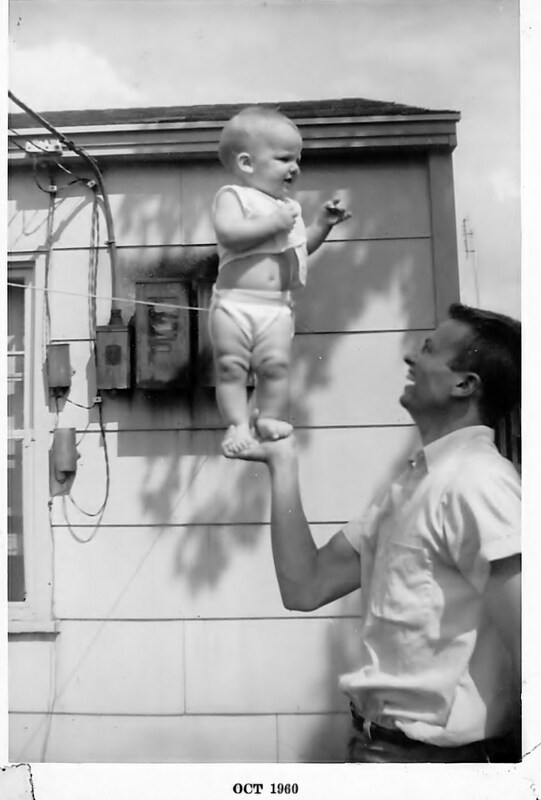 Daddy and me: October 1960. Still, I believe that even at age one I was contemplating my own possible leap into the void. Certainly I was already floating—rather too close to the power lines, but still. And like the bottle I have always wanted to find in a deep blue sea, I carried a message that I am still trying to figure out how to deliver. Maybe all I need to do is gather my courage, bunch up my shirt, and fly.